Playing Strategy For Live Ultimate Texas Holdem - Beat the dealer. 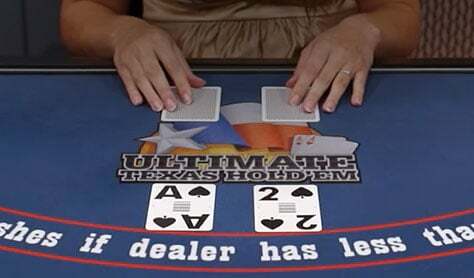 Live Ultimate Texas Hold’em is played against the house with the aim of getting a better 5 card poker hand than the dealer has. The unique thing about this game is the 3 betting rounds. You get to choose which betting round to lay your bet but only after the cards have been dealt. How cool is that? The game is as much about beating the dealer as it is about the betting strategy. 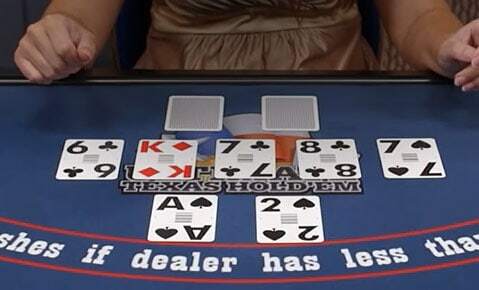 To play the game successfully you do need to understand the value of poker hands, i.e. what beats what. You’ll also need an appreciation of the probabilities of whether you’re likely to hit a winning hand at a particular point in the game. If you know these two then you have a reasonable chance of being able to maintain your bankroll for longer playing sessions or indeed walking away with a profit. But if you’re like me and have difficulty retaining information like this then a simple documented strategy can go a long way to help you enjoy the game more. Fortunately a few clever people have worked out the probabilities and statistics of when to bet depending on what cards are showing. 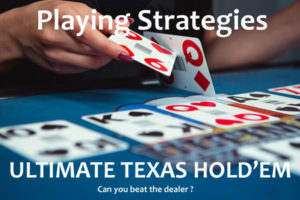 I’m going to share those playing strategies for Live Ultimate Texas Hold’em below. If you want more detailed information then refer to the research of Michael Shackleford at the Wizard of Odds, who has provided the information below. This is where you have been dealt the first two cards. No other cards are on the table. The raise is 3x or 4x your ante bet. Note: Always raise your bet by 4x. There is no value in raising by 3x, unless you have a depleted chip stack. A Pair of 3’s and above. Do not raise a pair of 2’s in this betting round. Unsuited King 5 or better. Unsuited Queen 8 or better. Unsuited Jack 10 or better. The flop, or 3 community cards have been dealt in the middle of the table. The raise is 2x the Ante Bet. Two pairs or better in front of you. A hidden Pair. (That’s a pair that is made up by one of your hidden cards and one from the flop). If there are 4 cards to a flush, including a hidden 10 or better to that flush. The Turn and River cards have now been dealt and there are now 5 community cards showing. At this point you can bet 1x your stake or fold. A hidden pair or better. or The dealer has less than 21 outs to beat you. Anything else you should fold your hand. The high card is the Ace, if this ties with another hand, then the second highest card in the hand is used as a tie breaker, and so on until the hand is won or tied. A hand of 5 cards that form a run. The suits do not need to be the same, so in this example we have a run of 3, 4, 5, 6, 7. Straights with a higher run value e.g. 5,6,7,8,9 would beat this hand. This is a set of 5 cards in a run, but all in the same suit. In this example we have 3c, 4c, 5c, 6c, 7c. 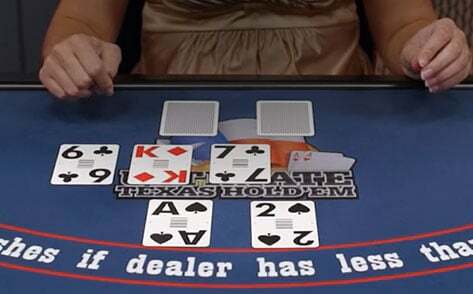 Watch me play using the optimal playing strategy for Live Ultimate Texas Holdem. If you want to try this yourself then Unibet have a table.